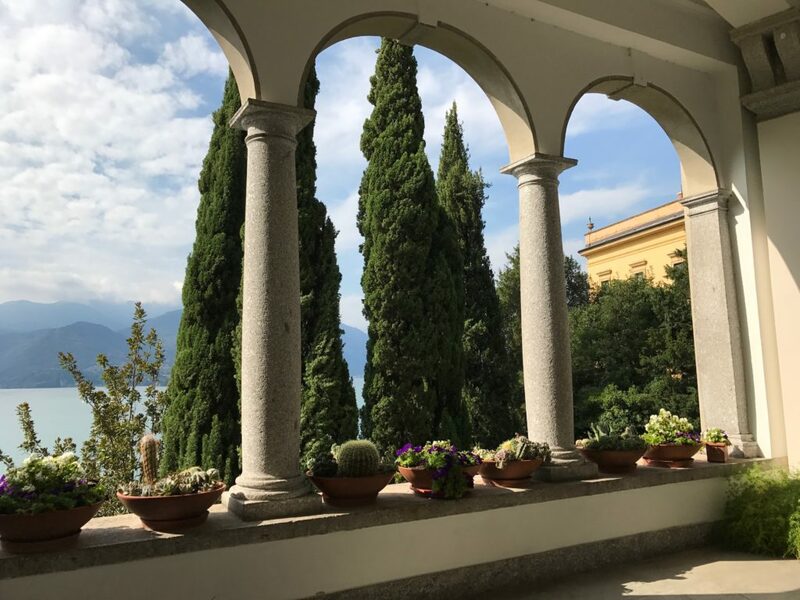 Villa Monastero is one of the several monumental villas mostly built or enlarged between the 17th and 19th centuries on one of the long coasts of Lake Como (also known in antiquity as Lago Lario) the deepest Italian lake. 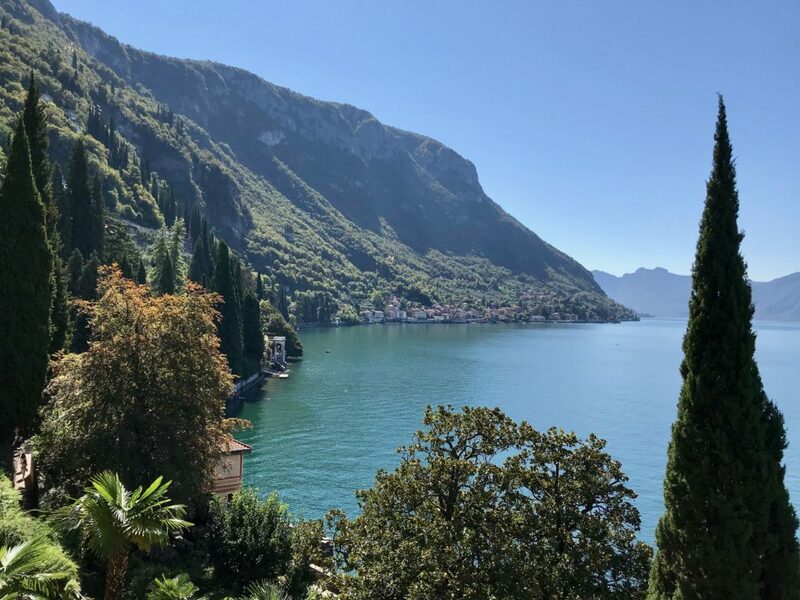 The villa is located in Varenna, an enchanting old fishermen’s village filled with pastel-colored houses on the eastern side of the lake, also known as Lecco branch, just north of the town of Bellagio across the strait. Bellagio derives from the Roman Latin word Bilacus because it straddles the two arms of the lake. Many visit Belaggio but Varenna is just as charming and not as crowded. The villa’s name Monastero derives from the presence of a Cistercian monastic nunnery or convent with a church dedicated to the Virgin, built at the end of the 12th century and the convent was operative until 1567, when it was closed by order from the bishop of Milan. 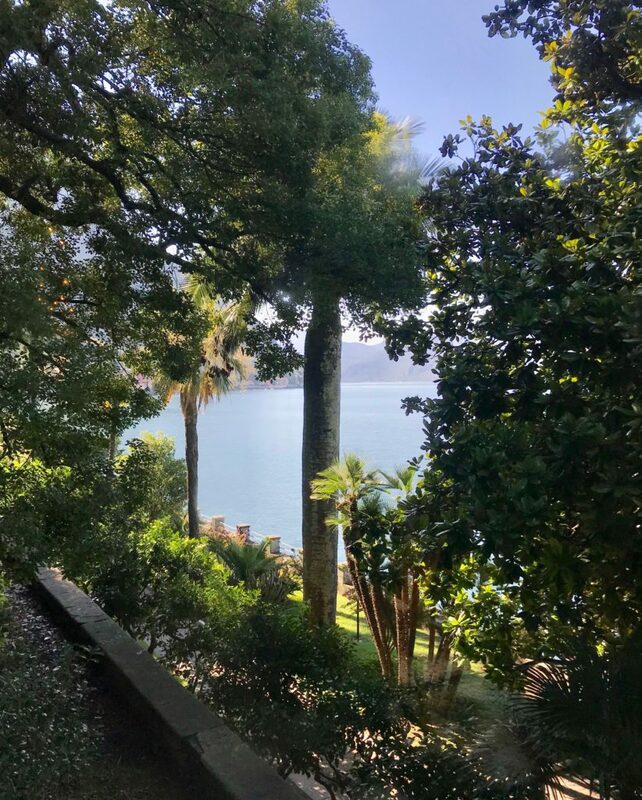 In 1569 the entire property with its lakeside gardens was bought by Paolo Mornico, a noble from Valsassina, the region with valleys and mountains that surrounds Varenna, who used it as his private home. Despite the new property, the access to the church of the monastery was granted for free to anyone. During the first half of the 17th century Paolo’s son, Lelio, demolished the monastery and built a villa, called Villa Leliana: two rooms and other architectural elements like the Loggia, still conserve the structure of that time. 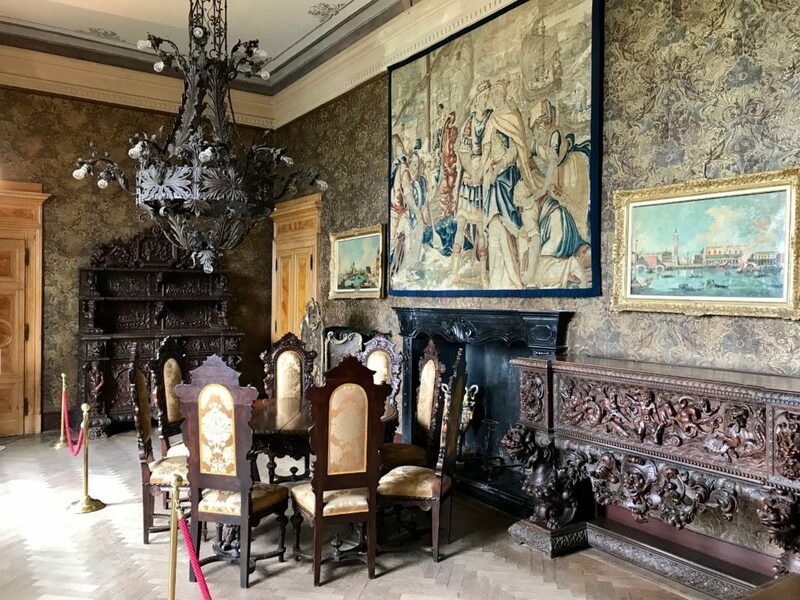 The Mornico family held the property of the Villa for three centuries: in 1862 the building was sold to the engineer Pietro Genazzini of Bellagio, who started some restoration works, unfortunately he was forced to sell it after few years due financial failure. The new owner became Carolina Maumary, a noblewoman of Milan, related to Alessandro Manzoni, one of the most important Italian writers. 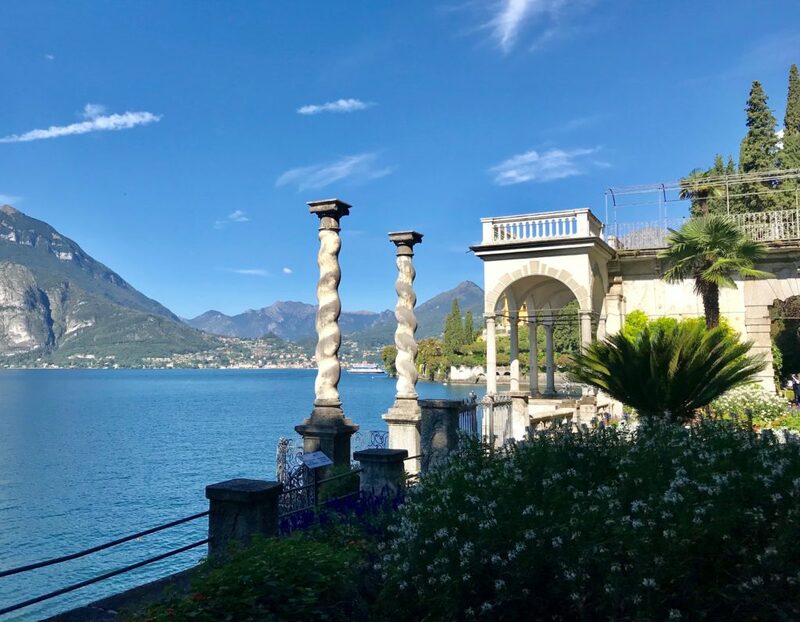 At that time lot of important people of the cultural world visited the Villa, and Lake Como in general, to enjoy the natural beauties and the mild climate. At the end of the 19th century the Villa was bought by Walter Kees, a wealthy German manufacturer originally from Leipzig, who decided to live in Varenna, he made important renovations that gave to the Villa the current outward look: the garden was enlarged and enriched with new plants and the rooms were furnished in an eclectic style, with German Romantic influence. Unfortunately Mr. Kees could enjoy his house only for few years, because after World War I the Villa was requisitioned by the Italian State as a war debt and in 1925 was bought by Marco De Marchi, a naturalist and a philanthropist of Milan; in 1939 he donated it to the National Institute of Idrobiology, to make it a Museum. 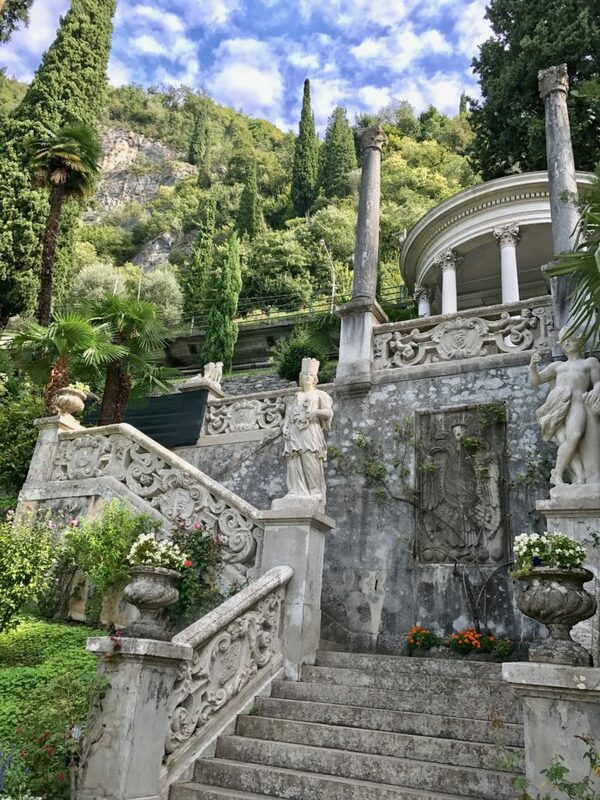 One of the villa’s greatest treasures is this long lakeside garden protected from the cold north wind by the steep mountain behind the lakeside. This allows many subtropical and even tropical plantings in the mild lakeside microclimate. As a Como historical resource, the Villa began to be used for scientific purposes and conferences: in 1940 the garden was opened to the public, while in 1953 they founded the convention center, still active, where they organize cultural and scientific meetings, without changing the villa’s exterior. 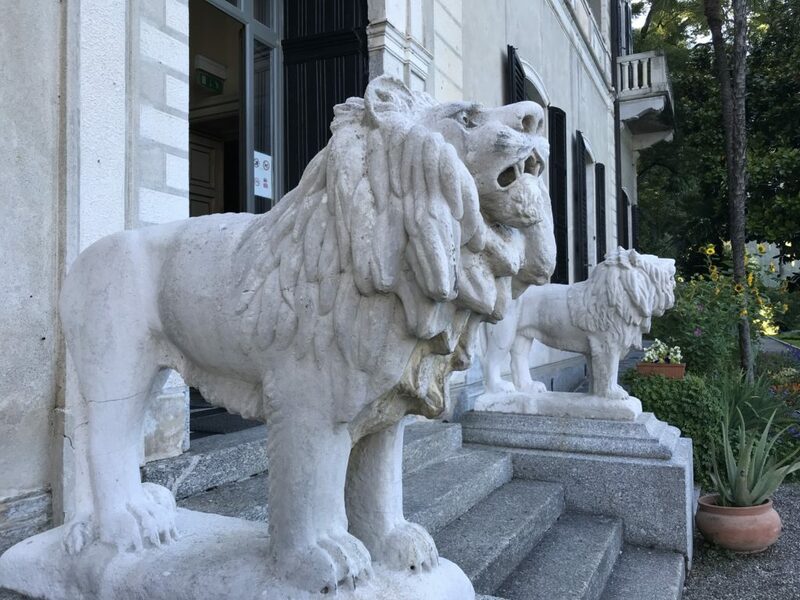 Now the Villa is a Museum and it belongs to the Province of Lecco; it’s opened from March to October and it’s possible to visit the inside and the garden and also rent the unique location for weddings. As mentioned, the gardens are one of the best attractions of the Villa: they extend for about 2 kilometers from Varenna to the near hamlet of Fiumelatte; the land is articulated in terraces, so the garden is divided in various levels, each terrace different from each other, but with some recurrent elements, like cypresses, cedars of Lebanon and hedges along with rare plantings, including bergamot, citron and other citrus. Probably during the 16th century there were lot of exotic plants like the Aloes and Agaves that were added to the Olive Trees and the Vineyards already here since the time of the monastery; the general structure of the garden terraces date back to Walter Kees, with some changes made by De Marchi at the beginning of the 20th century. The several dramatic tree species one can find throughout the garden are very interesting and testify to the happy climatic situation of Varenna: palms, agave, oleanders and the various citrus fruits already cited; at present there are more than 900 different species, and for this reason it’s identified as a Botanic Garden. Also the architectural elements that decorate the garden have the same variety of the plants: in fact you can find columns, balustrades, little temples or Classical follies, fountains, the Kaffe-House at the very end of the garden, that refer to various artistic styles, like Baroque, Classical or Moorish. 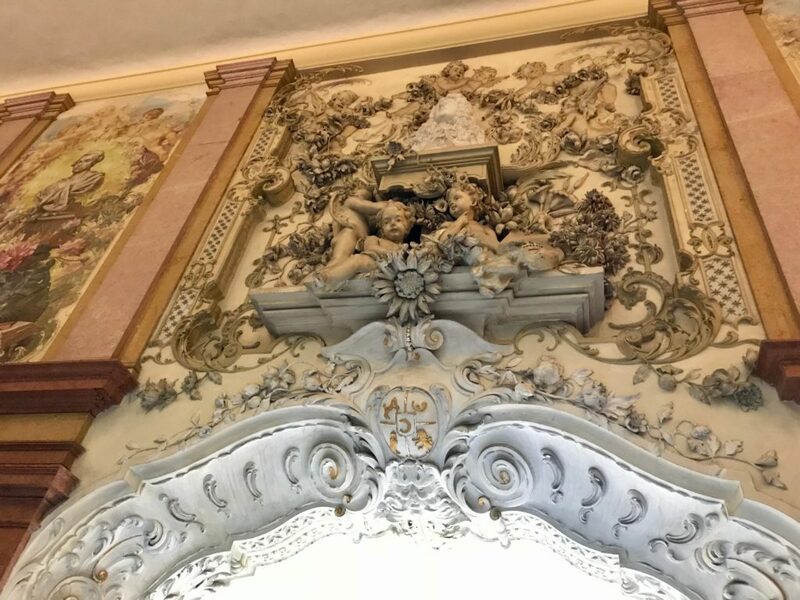 The most precious piece is the sculptural group “The Clemency of Emperor Titus”, in the folly (see photo below) realized by the Neoclassical artist Giovan Battista Comolli and located on the path that from the ticket office bring to the Villa. For the architectural decoration of the garden Kees drew inspiration from two other important Villas of the lake: one is the Villa Melzi of the Duke Francesco Melzi D’Eril, the administrative high officer of Napoleon, built in 1808-1810, and located in Bellagio, the second one is Villa Balbianello in Lenno, 17th century, a pleasure property of Cardinal Angelo Maria Durini; both these other famous villas are great examples of famous noble holiday residences on Lake Como. Villa Monastero’s interior is structured on two floors; at the ground floor two rooms conserve the architecture of the 17th century, when the owner was Mornico’s Family: they are called the Red Room, a reception room in Baroque Style, and the Mornico Sitting Room, the old office of the family; we can find also the Black Room, the Renaissance style dining room at Kees time, the Billiard Room and the Scientific Conference Roomin the old chapel, also known as the Fermi Room, in honor of the famous italian physicist Enrico Fermi who resided, studied and taught in the Villa in 1954; this room is the remaining part of the hall of the church, preserved until the end of the 19th century, when Walter Kees asked to stop its religious functions. The monumental staircase of the entrance hall, built by Kees with different kinds of marble (including Siena and Brescia) and richly decorated, leads to the upper floor with the other rooms: the South-east room, the private bedroom of Walter Kees’s wife Carlotta, with a small Sitting Room, the Council Room, a small service room called Oriental Sitting Room, furnished with Japanese pieces, the Music Room, that gets its name from the presence of two antique pianos, the main Bedroom and close by the wonderful bathroom in Pompeian Style, with oriental features. 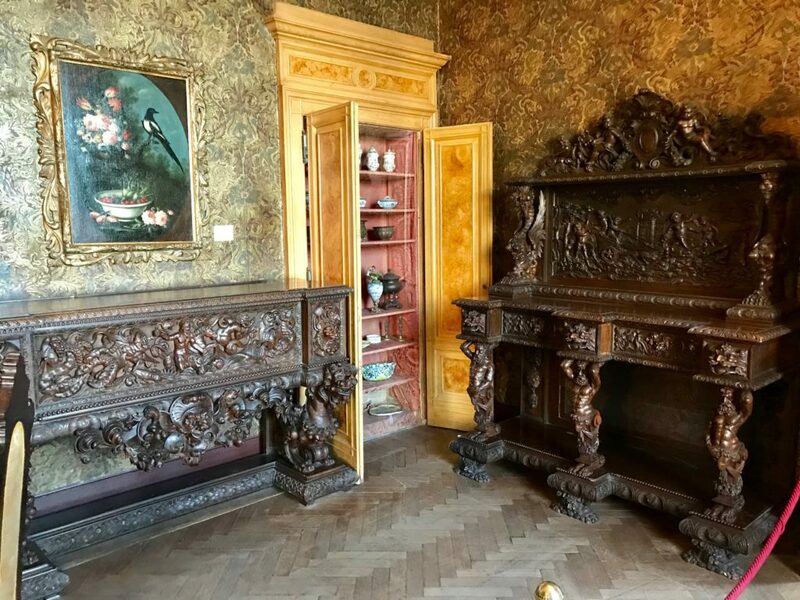 One room has sgraffito incised walls and another with beautiful Renaissance wood antiques with intaglio ivory. 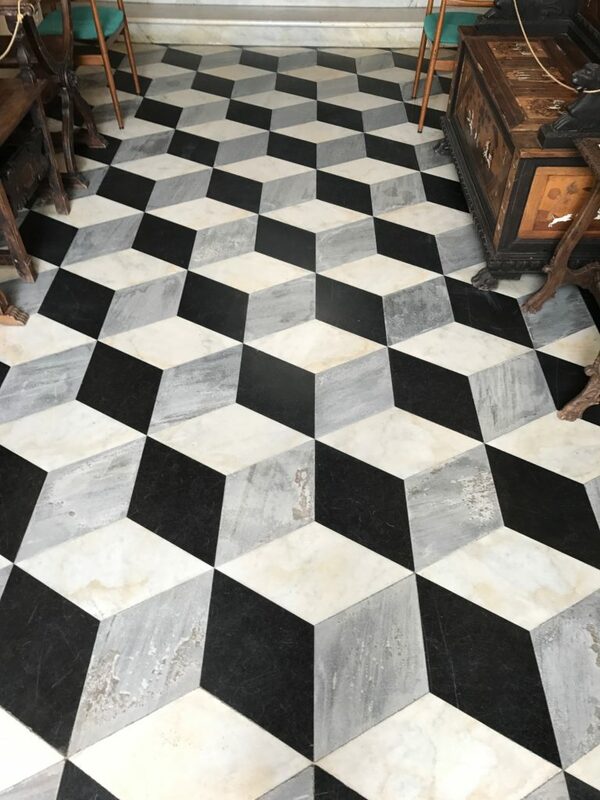 Some of the exquisite marbles are local like the black Varenna or from nearby Lago Garda like the Brescia marbles, and with Varenna marble mixed with the beige Siena and white Carrara in one opus sectile floor in lozenge tiles replicating the famous trompe-l’oeil fountain of the bronze House of the Faun in Pompeii. The Villa Monastero is one of the most important public properties along Lake Como, and while not as widely visited as Villa Carlotta across the lake at Tremezzo or other spectacular properties like the often-filmed cinematic Villa Balbianello on its peninsular setting in the middle of the lake at Lenno, the Villa Monastero is certainly worth every minute of a visit, especially for its interior treasures and rewarding lakeside views through the lovely gardens.